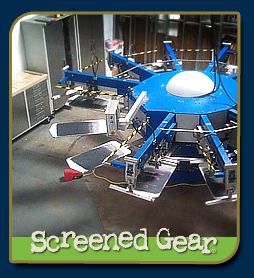 Screened Gear uses Plastisol inks from Union, WM and Rutland. There are many colors available. If you need other color options let us know. 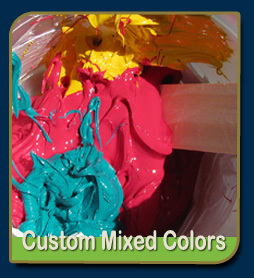 With our Pantone Mixing System we can make any Pantone Coated color you want. There is a fee of $25 per color for this service. We can print up to 6 colors per location. This means we can print a 6 color logo on the front, on the back and the sleeves. On larger orders or with screen fees we can print up to 9 colors on colored shirts and 10 colors on white shirts. 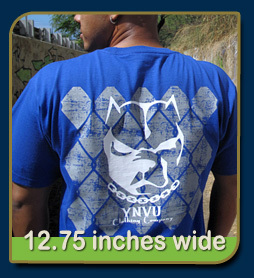 Our max print size is 12.75 inches wide by 16 inches tall. Some garments like women's tank tops have a much smaller print area. Keep this in mind when setting up your order. There maybe additional fees If you want the design resized for smaller garments. Base unisex adult shirts: 12.75" x 16"
Women's and youth shirts: 10" x 14"
Women's tank tops and toddler shirts: 9" x 12"
Infant shirts: 5" x 8"
Long sleeve prints: 3.5" x 14"
Short sleeve prints: 3.5 x 4"
We can handle just about any file format. But we do have a few preferred file types. The better quality files you supply us with the better the final screen printed garment will be. If your files are not vector or really bad quality there maybe a $35 redraw fee. You will be told in advanced if the fee applies. Adobe Photoshop (.psd) 300 dpi at size with layers. Make sure to leave all files in layers, outline or convert all fonts to curves. If you have any questions on the design or your files call us we are happy to help.